The unresolved seats sharing issue between Congress and Telangana Jana Samithi (TJS) is likely to be settled in Hyderabad in a day or two. 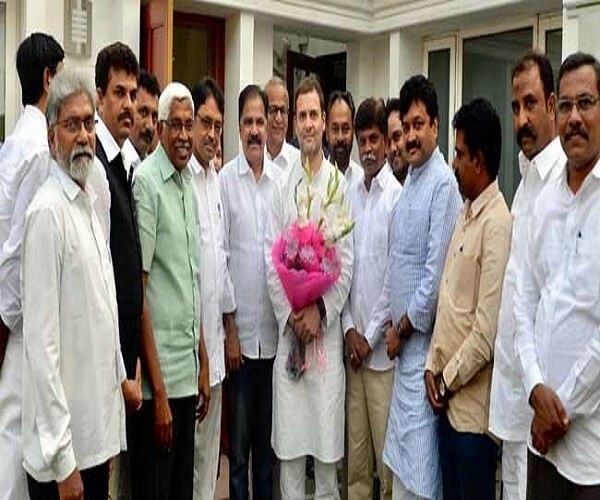 Congress president Rahul Gandhi has given directions to Telangana Congress to hold a meeting with TJS leadership and ensure the Alliance gets going at the earliest. A TJS delegation led by Prof.M Kodandaram called on AICC (All India Congress Committee) president Rahul Gandhi to discuss about future and working of Mahakutami or Prajakootami. Kodandaram and Co. decided on meeting the Congress boss in view of deadlock between Telangana Congress and alliance parties on sharing of seats and other issues. According to Kodandaram, the meeting with Rahul Gandhi lasted nearly 40 minutes. Elaborating details, he said that TJS stressed on expediting formation of Mahakutami and hitting campaign trail at the earliest. ALSO READ: Across Regional Boundaries, What Is The Right Approach In Allocation Of Waters? “The talk about Mahakutami for last few weeks has created confidence in the public that an alternative for better governance is possible. Hence the need of the hour is completing modalities for formation of the alliance. Understanding on common agenda and its implementation among the alliance parties is also very key. We told these things with Rahul Gandhi and he assured his full co-operation,” Kodandaram said, adding that it came to their notice that due instructions were given by AICC chief to TPCC after their meeting. When asked about number of seats TJS is interested to contest in upcoming assembly elections, Kodandaram said that they proposed 17 seats, but are okay if 15 seats are given. TJS chief said that Alliance talks got stuck due to deadlock on seats share. ALSO READ: (తెలుగు) దేశం పార్టీ లో అనైతిక, అసంపూర్ణ పోరాటం...! “Forming alliance just for the sake of power will not yield desired results. Our common objective should be to provide a better alternative for which a clear action plan is needed. As regards seats sharing is concerned, it should be done in a way so that alliance parties do not feel peeved,” he said, adding that TJS did not eye segments where Congress has sitting MLAs or strong leaders. Replying to doubts raised by Telangana Congress about lack of presence for TJS in most of the segments’, Kodandaram said that TJS penetrated even upto village level in 20 to 25 constituencies. He said TJS cadre has been working tirelessly in these segments for last few weeks and the party had sought such constituencies only. Previous article#HealthAlert: How ‘Fake Medicine Industry’ Is Putting Your Life At Risk? Next article#PollStrategy: Why ‘Swami Paripoornananda’ Contesting For Telangana Assembly Elections As BJP Candidate In ‘Kamareddy Constituency’? What Happened To ‘India’s National Free Medicines Policy’?